The use of formalin-fixed paraffin-embedded (FFPE) tumor tissues in flow cytometry (FCM)-based determination of tumor cell DNA content is more complicated than the use of fresh-frozen tissues. This study aimed to accurately measure tumor cell DNA content from FFPE tissues by separating tumor cells from stromal cells through FCM and investigating its prognostic impact. We separately measured the DNA contents of tumor cells and stromal cells by gating with pan-cytokeratin and vimentin (FCMC/V). 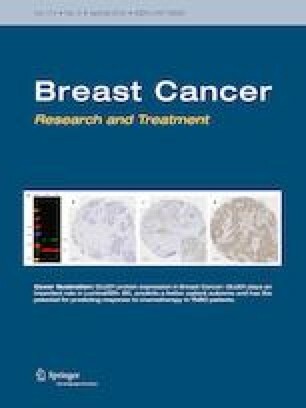 We evaluated tumor cell DNA contents [DNA index (DI)] of 290 FFPE tumor tissues and classified them into low and high DI groups, using a cutoff DI value determined through an unbiased computational method. The distribution of DI was bimodal, and a cutoff value was determined at a DI of 1.26. The high-DI tumors were associated with aggressive phenotypes and had significantly worse distant recurrence-free intervals (DRFI) than low-DI tumors. Multivariate analysis revealed that lymph node metastasis, Ki67, and DI were independent factors affecting DRFI. Accordingly, patients with low-DI/low-Ki67 tumors had excellent outcomes compared with other tumor types. Multiploid tumors were associated with increased lymphocytic infiltration and aggressive phenotypes. The DI of FFPE tumors could be precisely determined through FCMC/V. A combination of DI and Ki67 analyses may be able to predict the prognoses of breast cancer patients with greater accuracy. The online version of this article ( https://doi.org/10.1007/s10549-019-05222-y) contains supplementary material, which is available to authorized users. We thank Dr. Jun-ichiro Ikeda (Department of Pathology, Osaka University Hospital) for pathological evaluation and Dr. Wataru Kikuchi (Nittobo Medical co., ltd.) for technical assistance. This study was supported in part by the research funding from Nittobo Medical, Tokyo, Japan. This study was supported in part by Japan Agency for Medical Research and Development under Grant Number JP17he1302014. Noguchi S. has been an adviser for Taiho, AstraZeneca and Novartis and has received honoraria and research funding for the other studies from AstraZeneca, Pfizer, Novartis, Chugai, Takeda, Nippon-Kayaku, Nittobo, and Sysmex.